Scaling innovation in complex systems – On nature, technology and connectedness. Last summer I was invited to do a keynote on my approach to scaling innovation in complex systems. The result was a distillation of several years I have spent analyzing complex problems and developing frameworks to make sense of them. I’d like to share an abridged version with you (focusing on the framework, sparing some examples), in hopes that it inspires creative thinking on important social and environmental problems. 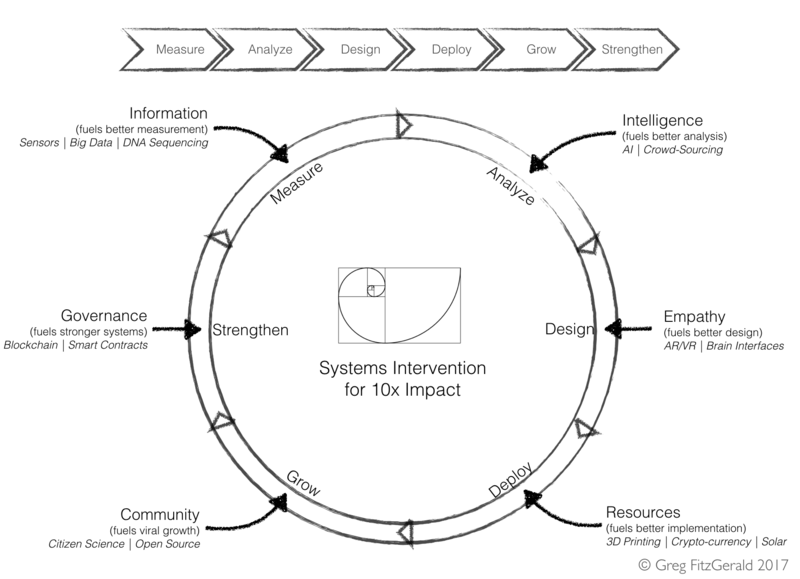 In this post I’ll provide a brief overview of my systems lens, and offer a technology-enabled way of thinking about large scale systemic innovation. From the beginning of my career I’ve been working on systems problems. My systems perspective was highly informed by my study of robotics. 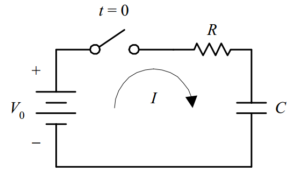 One of the most interesting pieces of theory I learned during engineering, was that any system – mechanical, electrical, or social – could be modelled with an electrical schematic. All systems have sources. They have resistance properties. They have capacity issues! Vive la résistance! 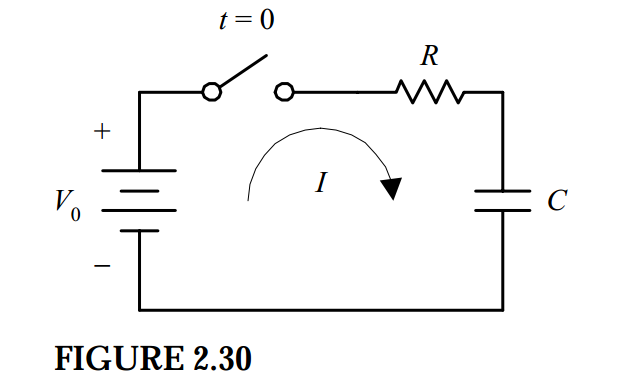 Basic circuit schematic with flow, resistance, capacity, source and switch. Engineers perform a very logical breakdown of problems, then build them back up again with a better understanding of the role of each system component. I loved the process of engineering, but found myself much more fascinated by social systems than robots (though I did get to build a cool robot guitar). This is what drove me into management consulting, and ultimately getting my MBA. In reflection I feel I’ve gained a valuable skill that offers an interesting take on the social sciences. My favourite course during my MBA was “Strategy & Innovation” taught by Dr. Marc Ventresca. In his class, we learned about the power of networks, and the outsized impact they create compared to individual agents within the system. Despite our affinity for individual hero stories, this more or less seems to be true. During my coursework, to apply this theory, I mapped the social innovation ecosystem. One of the first things to do when mapping your system is to identify the types of players. Who has a vested interest in the outcome? Who else influences the outcomes? What are the relationships between all of these people and groups? 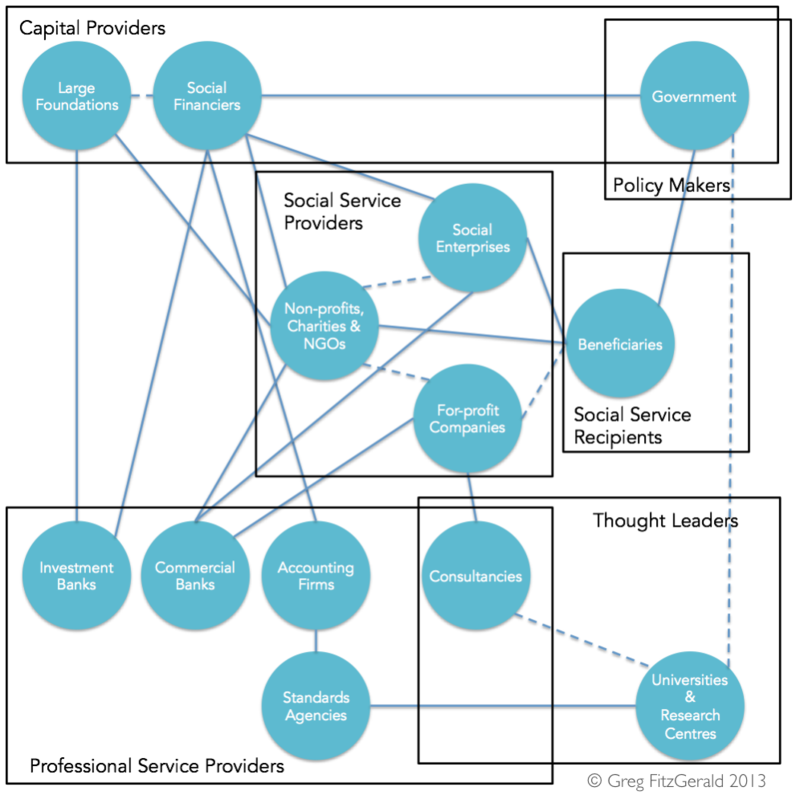 Example: A system map of the social innovation ecosystem showing weak and strong ties, and stakeholder domains. Great, you’ve mapped the players! Now consider what drives their behaviour. What are the positive and negative incentives within the system? To architect an effective solution you’ll need to understand these dynamics. My system design process augments the conventional “measure-learn-build” loop with a few extra activities. Measure: How does the system behave? Analyze: Why does it behave this way? Design: Propose a better way. 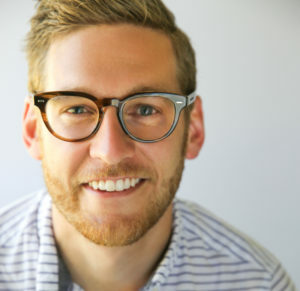 Grow: Get more people to use your solution. Strengthen: Reinforce what you’ve built so it doesn’t break and institutionalize it. I also categorize a set of “fuels” that power, or enable the dynamics of the system. Information: Base level data you can gather on the system. 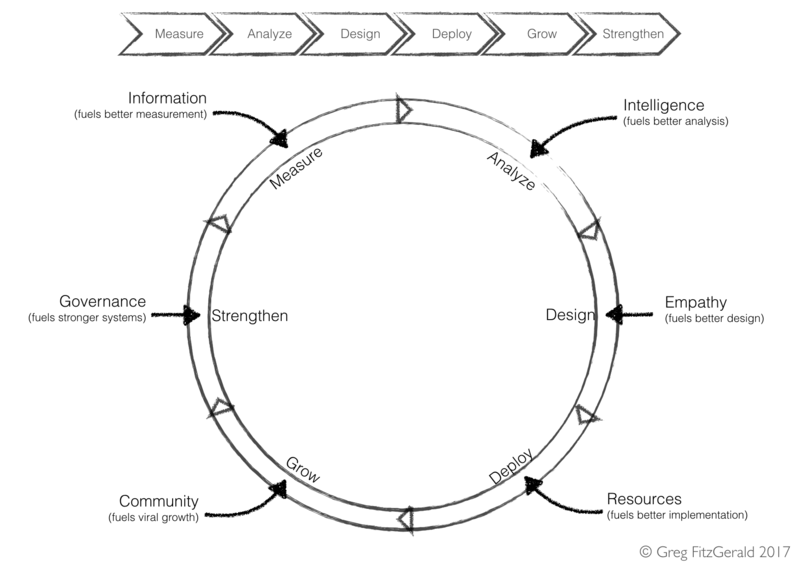 Intelligence: Insights and models you can apply to understand the data. Empathy: Contextual understanding of system stakeholders and their motives. Resources: Capital and materials to build your solution. Community: Dedicated supporters and advocates who care about what you’re doing. Governance: Policy and cultural norms that solidify new practices. More fuel, more power. As you iteratively design within a system, gathering more fuel powers more action. This becomes extremely important as your system interventions grow. System design activities and fuels. 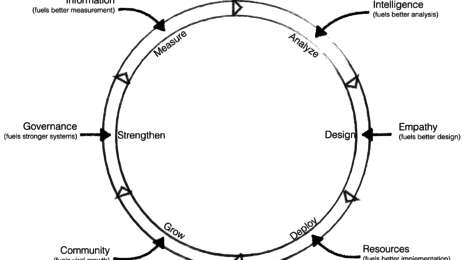 Innovation is an iterative process. Don’t expect what works for your first 10 beneficiaries to work for your next 1000. Successful innovations won’t grow linearly, and you can’t expect your initial system understanding to carry you through the ultimate scale you’ve targeted. You need to keep gaining context throughout – more data, more empathy, larger community. I think of this process like the growth of a nautilus shell. 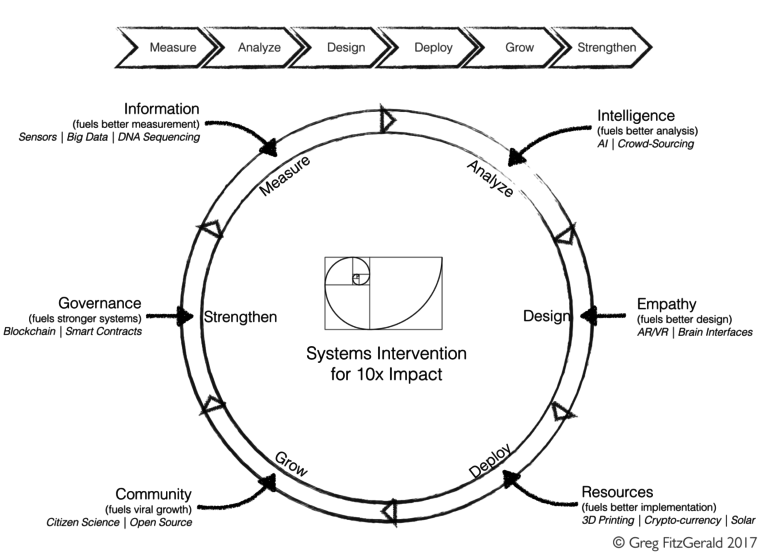 Ambitiously, I challenge systems innovators to target 10x growth on each iteration of design and implementation. This requires you to break your mindset and your own assumptions of what worked the first time. Your personal effort is fixed and 10x impact on each iteration is a difficult goal. You need to engage exponentially more people, and my personal opinion is that this kind of impact absolutely requires exponential technologies. 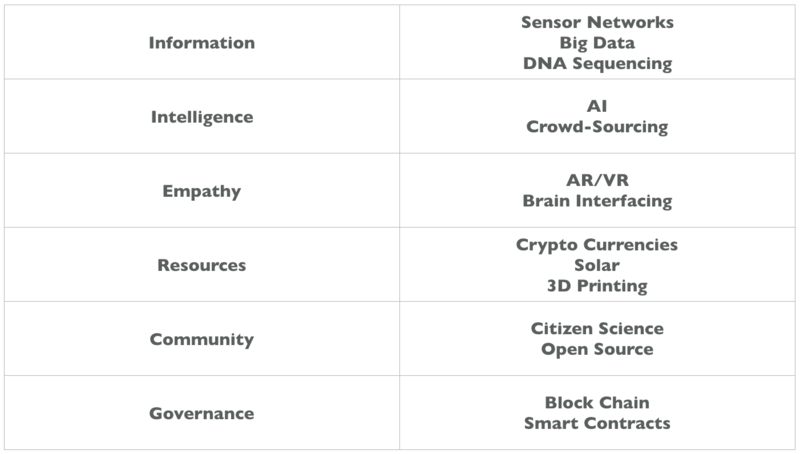 For inspiration, I mapped some of the latest, emerging technologies to each of my fuels below. Consider how you might take advantage of these tools to amplify your work. Exponential technologies for system fuels. And voila! Here is my full approach to scaling innovation in complex systems. The full picture – a framework and method for 10x impact. There are serious repercussions to omitting any of these fuels or stages in your design process. A lack of empathy can lead an NGO to deliver corn meal to poor rural communities without the equipment or know-how to safely consume it. A lack of community will keep your brilliant idea idle. Ignoring governance and active political lobbying can allow a future administration to completely dismantle your work. Consider these to be more than a guide – they are a checklist to ensure you maintain your integrity as you design innovations that will impact people’s lives. There’s a reason I call out measurement explicitly. It’s easy to fall victim to confirmation bias, and convince yourself your insights and designs are amazing. Committing yourself to system re-profiling and active measurement will ensure you don’t lose focus of your ultimate goal. I hope to offer a future post that deep dives on system profiling and emergent planning, so watch this space.